This is so exciting! It’s the first Perfect Picture Book Friday of 2016! Just think of all the terrific books we’re going to read and share this year! Before we get to it, though, one quick housekeeping note! As I mentioned Wednesday, I’m about to have a brand new website and blog! Actually, I kind of already do – it’s up! Which, if you’re reading this on wordpress you know because you’re here 🙂 We’re just still working out a few kinks… so don’t be shocked or horrified if you see a typo or something looks a little off kilter (but do please let me know! 🙂 ) I hope you like it as much as I do! So I hope everyone is flocking over here and dragging all their friends and relations along to join the fun and now let’s get to this fabulous book already! Brief Synopsis: A girl and a boy with active imaginations each have very different ideas about what makes a fun game. Will the afternoon end with two kids playing alone on opposite sides of the room, or will they find something that is fun for both of them? Links To Resources: Class Compromise Activity for grades 3, 4 & 5 – Planning A Class Party; let your child or student draw a picture of what they think would be a fun game to play; discuss the meaning of compromise and the importance of getting along – what would happen if everyone insisted on getting his/her own way? Give examples of situations where people might have to compromise and have kids discuss how it could be handled, for example if one child wants to go to the zoo and the other wants to go to the playground, or how to plan a family picnic that will be fun for a variety of interests, etc. Why I Like This Book: First of all, how fun is it that I got to read this book and share it with you when it’s not even out yet?! 🙂 This is a delightful story, told completely through dialogue and illustration (a good mentor text for writers who are working on similar stories.) The writing is spare and there is no written narrative – it’s all a conversation. The girl is completely sure that her idea is best, her game the most fun…and not surprisingly it gives her the starring role. The boy is equally convinced that his totally different idea is best, his game the most fun…and not surprisingly it gives him the starring role 🙂 Anyone who has ever spent time around kids will recognize this dynamic. The children’s imaginative descriptions grow more and more elaborate as they try to convince each other, but it is not to be. Before long the girl is playing her game, and the boy is playing his. But they are side by side… sneaking glances at each other… ultimately unable to resist their curiosity about each other’s games and the allure of having someone to play with, not just next to. The resolution is just right – very believable – and brings young readers full circle. But one of the best things about this book is the art! Childlike crayon drawings depicting the imagined games – SO much fun, and not to be missed! Have a wonderful weekend, everyone! And don’t forget (hopefully I won’t forget! :)) that we’re going to have a special blog post on Monday to vote for all the best Would You Read It pitches from September, October and November! Would You Read It Wednesday #196 – Unicorn With A Stache (PB) PLUS Some New Year’s News! A Plethora Of Pitch Picks! Wow! I love your new website!! It looks fantastic!! And this new book looks amazing, one I’d definitely be interested in having in my classroom! Fabuloso! Will the Perfect Picture Book List be accessible from here too? Nice looking website Susanna. Your hard work is paying off 🙂 I like the color scheme, and the layout. Easy to navigate and find what I am looking for. No overload of information in any one spot – very organized. Feels cozy, too. Good job! I subscribed. And I also found your YouTube channel, which I didn’t know you had. PS You are my first subscriber on YouTube, and I don’t even have any videos yet! Haha 😀 I’m working on it. Thanks for the vote of confidence. The new website looks fabulous, Susanna! And the book sounds fun — and very relatable! Thanks so much, Gabi! I’m so glad you like the site – I’m really happy with it! – and the book is such a fun one! Doggone it! I left a message here in the wee hrs of the morning, before I finally fell asleep – but it was a happy sleep because for the first time I was first in leaving a comment on PPBF. But now it has vanished. Was it just part of my dream? To be first in line on your first PPBF post on you warm and friendly new site and blog? In any case, it was a warm and friendly dream! Book looks great! Even if you technology absconded with your first comment, you are first in my book dearest Jules 🙂 I’m so glad you like the site! My technology can drive me crazy at times, but then I probably tend to blame it for more than is deserved! Oy veh! Your site looks great!!! I love this concept. It’s so universal. This book sounds very much like Lady Bug Girl and Bumble Bee Boy by Jackie Davis. Have you read it? Will have to check this one out. Hi Susanna, Oh what a b-e-u-t-i-ful spank’n NEW WEBSITE!!! Many congrats!!! I love wordpress, I’ve been blogging with it for quite sometime. 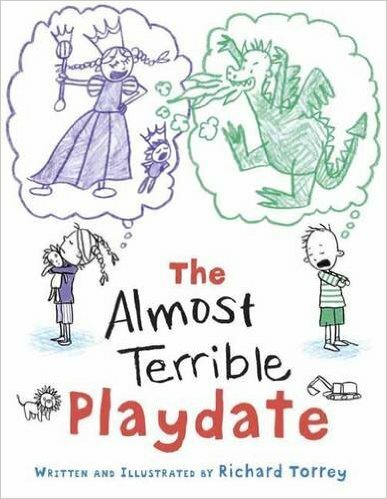 “The Almost Terrible Play Date,” sounds like a great read, I’ll have to look it over when it’s out. Happy New Year, Cheers! Aw Shucks, Michelle, thanks! I’m so glad you like it. I feel like I’m stumbling around blindfolded a bit, trying to get used to the new system over here, but I think once (if!) I figure it out it’s going to offer a lot more options! Hope you enjoy the book when it comes out, and Happy New Year to you too! This looks great, Susanna. Congrats. Thanks for telling me about the book. I will check it out. It sounds cute. I’m so glad you like it, Rosi! I’m really pleased with how it came out… even though we’re still working on some stuff 🙂 I hope you enjoy this book when it comes out and you get a chance to read it!